The Liberty Liner operates at the museum for the first time since 1996 on Members Day, 2011. Photo Date: May 21, 2011. It is actually a four-car, air-conditioned interurban train which is permanently coupled together. The length of the train is 156 feet long. The train was designed to be able to operate on the famous Chicago “El” picking up and discharging passengers. Both trains were designed for the North Shore line in an attempt to win back ridership from the competing Chicago Milwaukee, St. Paul and Pacific Railroad, as well as the personal automobile. At the time of their construction the trains were the most modern interurban trains ever constructed. The trains are unique in that they each had a tavern lounge car, famous for their “Electroburgers.” Known as “Electroliners” on the North Shore, both trains operated between Chicago and Milwaukee, running for millions of miles over the years. The trains could easily operate at 90MPH and had eight electric traction motors of 125 horsepower each giving the train 1,000 horsepower. 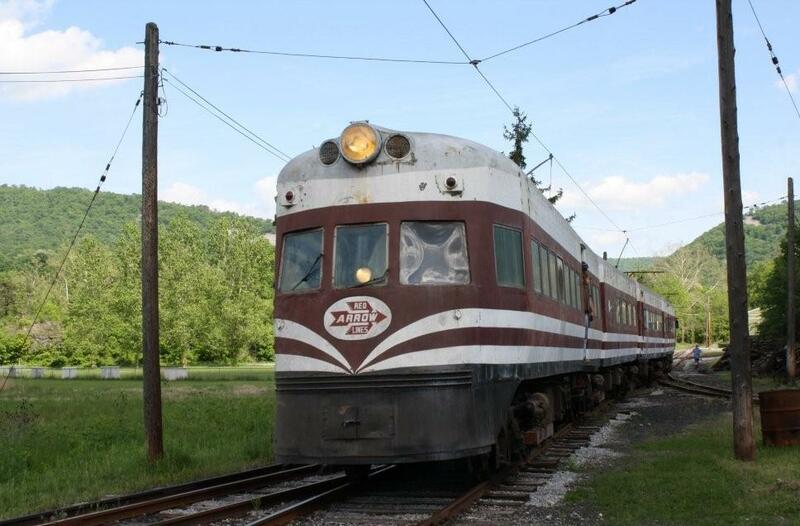 The North Shore line abandoned operations in January, 1963, and both trains were sold to the Philadelphia Suburban Transportation Company, known as the Red Arrow Lines, of Upper Darby in suburban Philadelphia. 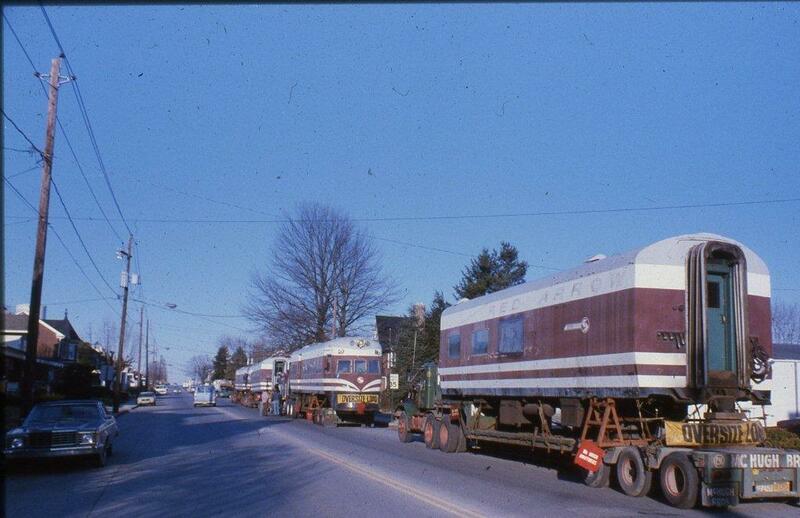 They were moved on their own wheels from Chicago to suburban Philadelphia. The Liners feature a tavern lounge car. At the museum, dinners have been served aboard the train. Photo Date: October 10, 1987. 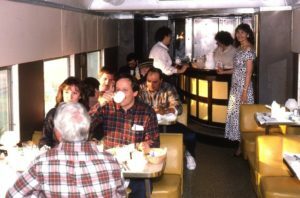 Once on the Norristown line, both trains were refurbished inside and out and were renamed Liberty Liners, one being named “Independence Hall” and the other “Valley Forge,” The tavern lounge car served the passengers various breakfast, snack, and light meal items in the mornings and afternoons. They even carried a liquor license, which was quite unusual for an interurban rapid transit operation. Both trains operated on the Norristown line into the 1970s. The Liners were not well suited for the type of operation on this 14-mile line, which is full of curves, hills and short distances between stations. Rather they were designed for flat, mid-western terrain to operate at long distances between station stops. 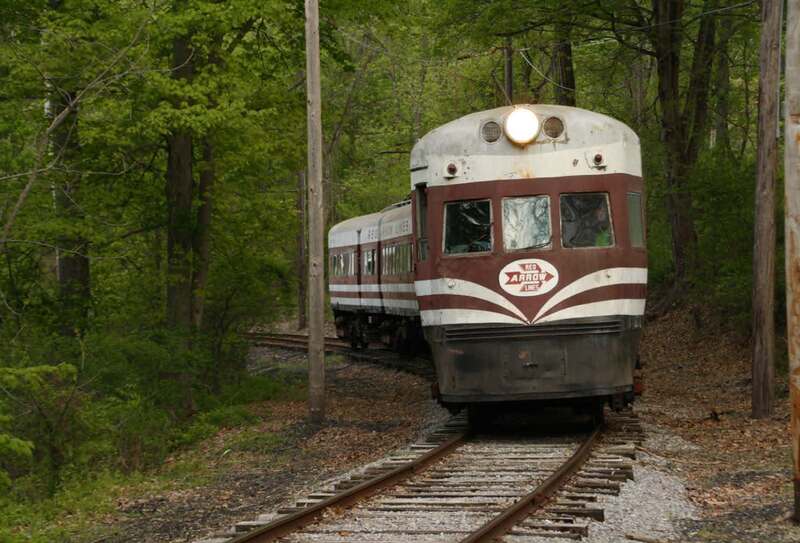 Both trains were put up for sale by SEPTA in 1981. Our museum was the successful bidder for the Independence Hall. Six tractor trailers and a large crane were needed to dismantle the train, move it from Philadelphia, and reassemble it at the museum. Since its arrival, our priorities have been to perform preventive maintenance, getting the train to operate, and moving the train indoors for the first time in over 35 years. It is currently stored in the museum’s Carbarn Two. Six tractor trailers were used to transport the Liner from Philadelphia. The caravan made for a strange sight along route 30 as they traveled to the museum in Rockhill Furnace.